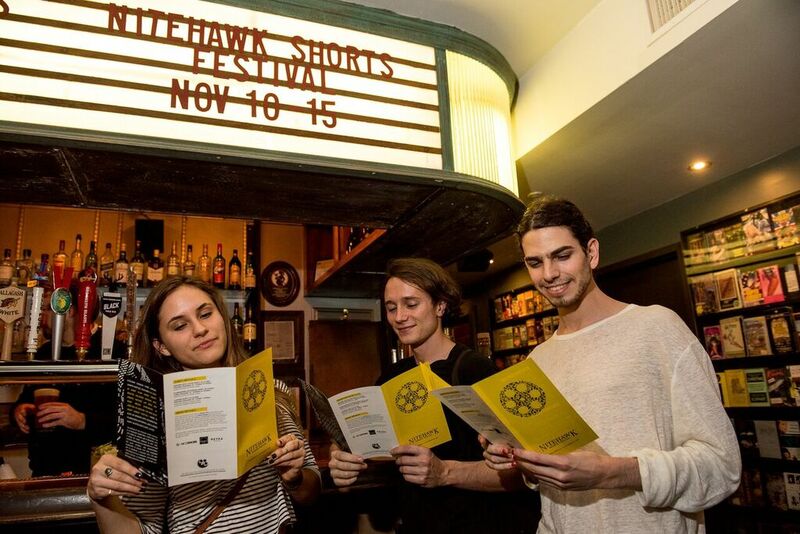 For the third year Nitehawk has presented its annual NITEHAWK SHORTS FESTIVAL featuring short films under twenty minutes and, as in previous years, we’ve been proud to host so many extremely talented (and nice) filmmakers! For three years running, Halloween at Nitehawk has meant one thing: A Nite to Dismember, an all-night horror movie marathon starting at midnite and going way, way into the soft November sunshine. Anchored with the theme of “Decades of Horror,” this year’s slate of films was Poltergeist (80s), House on Haunted Hill (60s), A Bay of Blood (70s), Scream (90s) and a new mystery film off the festival circuit: The Mind’s Eye. On top of all that was a costume contest, trivia, goodie bags, slap-happy drinking games all led by Shudder‘s Sam Zimmerman and Nitehawk’s own Kris King. Survivors (more this year than others) of the evening were treated to a cupcakes from our neighbor Sweethaus, and a breakfast spread and cereal bar provided by Post. As has become a Halloween tradition at Nitehawk, we’ve once again invited our staff into a game of costumed brinksmanship for cash prizes and alcohol all for the rest of our enjoyment. Winners of these prizes have yet to be decided, but we do have the contestants from this past weekend, and they’re all listed below. Who will come out on top this year? Will it be Bartender Hunter for his scary Bob Dylan looking thing? Or will it be Manager Nicole who lived out her lifelong dream of walking around town covered in blood? Or will it be The Nitehawk, a mysterious masked crusader who works night and day to serve you drinks while you watch horror movies? Photos: MALLRATS Outdoors w/ BuzzFeed & Kevin Smith! 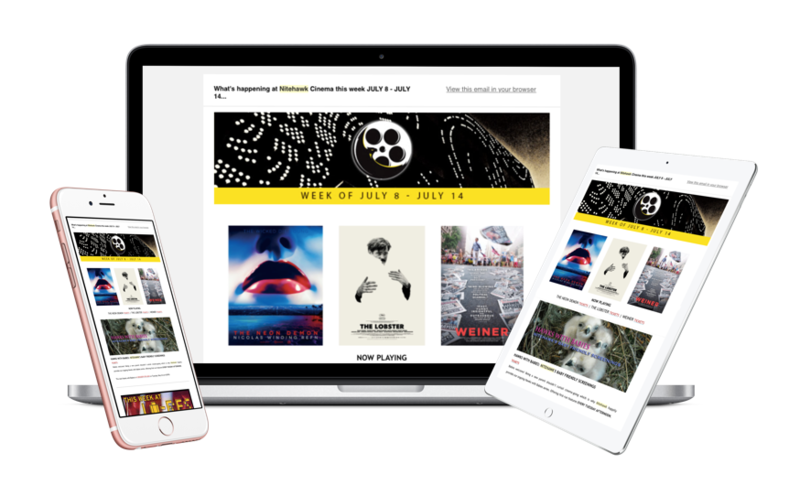 This summer, Nitehawk got together with the kids at BuzzFeed for Throwback Theater a series of outdoor screenings at 50 Kent that included BILLY MADISON with Blue Point Brewing Co. and MALLRATS with director Kevin Smith coming in for a Q&A before the show. Word spread fast, and the line snaked around the block as the hot August sun gave way to a cool summer evening. With over 2000 people in attendance, all lubed up on beer and burritos, Smith talked Star Wars (‘natch), the upcoming Mallrats 2 (“Die Hard in a mall”) and whether he or Ben Affleck make a better Batman. According to Smith, this was easily the largest crowd for a Mallrats screening of all time — so cover that pretzel in chocolate and eat it. Pics below. Shout out to the people who helped make it happen: Bell’s Brewery and Reyka Vodka for the hangover fuel; and Best Buds Burritos, The Meat Hook, Landhaus, Odd Fellows Ice Cream, Luzzo’s for making up the best mall foodcourt of all time. Another year, another fantastic Shorts Fest under our belt. In five days we screened over 30 shorts made by local and international filmmakers with many of them coming in for Q&A’s and drink themselves silly. Below there’s a gallery of the goings on for two of the nights: Our Opening Night, and the Friday night Filmmakers’ Party. See y’all next year! Every Halloween here at Nitehawk, we hold a costume contest for the whole staff. With cash and free booze on the line, the whole team goes all out scrounging up the best movie costumes they can muster. This year’s crop was pretty awesome, covering everything from Kid Rock and Joe Dirt, to John Waters and that woman in red from Fire Walk With Me. Jules Feiffer. Illustrator for Norton Juster’s book The Phantom Tollbooth (1961). Seems silly to even list what legendary Chuck Jones has done since you know him from pretty much every Looney Tunes cartoon ever but here goes…animator of How the Grinch Stole Christmas, creator of Marvin the Martian, Pepe LePew, the Road Runner, and Wile E. Coyote, and the director of animated cartoon shorts starring Bugs Bunny, Daffy Duck, the Road Runner and Wile E. Coyote, Pepé Le Pew, Porky Pig. And then he directed that outrageous film we love, The Phantom Tollbooth. Like everyone else who loves film, we love Michael Powell and Emeric Pressburger (aka The Archers)! Since we’ll be screening their last collaborative movie The Boy Who Turned Yellow this weekend as part of our Cheeky Monkeys series, we thought it an ideal time to reveal in their beautiful films by listing our favorite stills from our favorite Powell and Pressburger films! Jeff Bridges has been snapping photos since he was a high school kid, and starting with Starman, he began using his Wide-Lux 35mm camera to take set-photos to collect as keepsakes for the cast and crew. His shots are casual, and feature a huge array of stars kicking back in their insane costumes. Loads of familiar faces pop up: Francis Ford Coppola, Peter Bogdanovich, Beau Bridges, Michelle Pfeiffer, Gary Busey — everyone he’s ever been in a movie with, really. Bridges collected his favorites in a 2006 collection, Pictures.